This guide concerns partner accounts only. Partner accounts are available for annual premium plan, enterprise plan or event plan > 20TB. If you are interested to become a partner account, please contact your account executive. On January 19th of 2017, we released a Beta Test version of a new sub-account management system for the partner account. The goal of this new management system is to allow you, as a partner account, to directly manage your sub-account from your own DaCast account. This is actually your partner account manager navigator in the new back office. As a partner account, you now have the possibility to white label your DaCast account and customize it with your own logo and colors. Note 1: Your theme customization will apply to all of your sub-accounts. However, please note that when you switch to a sub-account to manage it, the color of the top bar will be red to indicate you that you’re not in your own account. Note 2: Removing all the mentions of DaCast in your sub-accounts is possible via our professional services and if you are already on an annual pro plan. Please contact us if you are interested. Let’s review each of these actions in details. To create your sub-account you need an email and to set up a password for this account. You also have the possibility to control which sections the sub-account will have access to. To do so, please turn ON all the pages you would like your sub-account to access and OFF all the pages you would like to hide. For instance if you want to give your sub-account the possibility to create Live channel and VOD only, just turn ON those 2 sections. 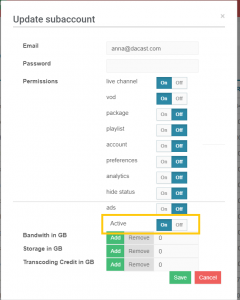 If you do not want your sub-account to receive an activation email from DaCast, please turn OFF “send an activation email”. Once you are satisfied, please click SAVE and then refresh your page. Once the page is refreshed, you should see the new sub-account at the bottom of your list of sub-accounts. Please note that you cannot delete a sub-account as it would delete all its history. To deactivate a sub-account, you can edit its email by adding a series of number in front of it to prevent the sub-account from logging back in. Once you are satisfied, please click SAVE and then refresh your page. Once your page is refreshed, any change you made in sub-account will be applied. As a first step, please verify the total amount of remaining data (bandwidth) you have in your own partner account. This will give you an idea of how much data you can allocate to your sub-account. To allocate data to a sub-account you just need to add a specific amount of data in GB in the field framed in yellow in the screenshot above. Once you are satisfied, please click SAVE and then refresh your page. Once the page is refreshed, all the amount of remaining data will be up-to-date. The process is exactly the same as for allocating data to a sub-account. As a first step, please verify the total amount of remaining storage you have in your own partner account. This will give you an idea of how much storage you can allocate to your sub-account. To allocate storage to a sub-account you just need to add a specific amount of sstorage in GB in the field framed in yellow in the screenshot above. Once you are satisfied, please click SAVE and then refresh your page. Once the page is refreshed, all the amount of remaining storage will be up-to-date. Method 1: Use the switch bar located in the top bar of your partner account. Please enter the ID of the sub-account you want to manage in the search bar framed in red in the screenshot above. When you are done with a sub account, you can simply click on the QUIT button and the window will be automatically closed. Once you have switched to a sub-account, your sub-account will open itself in a new tab as explained in the first method. For more information on transcoding limits, please click here. As a partner account, you can give as many transcoding credits as you want to your sub-accounts as long as you have enough transcoding credits remaining in your partner account. This is exactly the same process as with bandwidth and storage. As a first step, please verify the total amount of remaining transcoding data you have in your own partner account. This will give you an idea of how much data you can allocate to your sub-accounts. Please remember that the transcoding credits you are giving to your sub-accounts will be deduced from your own transcoding credits. 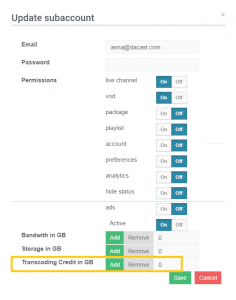 If you do not have enough transcoding credits remaining on your partner account, you can purchase more via the “Purchase” section of your DaCast account (Read this article). How to give transcoding credits to a sub-account? You can give transcoding credits to your sub-accounts the same way you allocate bandwidth and storage to your sub-accounts. This new function allows you to get an accurate list of your active sub-accounts in just a few clicks. By switching the status “Active” to ON (as referred on the screenshot below), you mark your sub-account as an active sub-account. If you turn this swich to OFF, this means your sub-accounts is considered as inactive. You may want to mark inactive all your test sub-accounts and cancelled sub-accounts. Once you have mark your sub-accounts accordingly, you can easily get your list of active by getting in the section Account – Sub-Accounts. Note that an inactive sub-account can still stream and upload video if it still has enough data, this is just a display feature for your own accounting activity. To prevent a sub-account from using his account, we invite you to remove all his data. The status page gives the sub-account an update of his data and storage usage. The display is the same as the one you have on your purchase page but sub-account do not have any plan and they cannot see DaCast pricing. 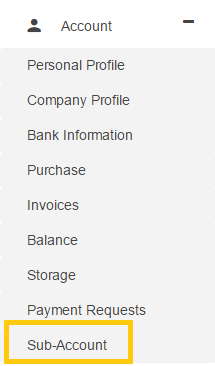 You can decide to hide the status page of your sub accounts when editing your sub accounts. Clicking on OFF will hide the status page of your sub account.